Welcome to our North Carolina School Report Card, where you will find information on our schools’ student achievement, attendance, class size, safety, teacher quality, technology resources, and parental involvement. Each of the four public charter schools in the Charter Day School, Inc. (CDS, Inc.) family is managed by The Roger Bacon Academy, Inc. (RBA) which provides a robust classical curriculum taught with the proven Direct Instruction method. Uniquely, the schools’ classical curriculum includes coursework in Latin, Cursive, and Grammar. Our public schools of choice do not implement NC’s Common Core curriculum. Each year, our schools confirm and advance the mission of providing the highest quality educational experience in a safe, clean, spirited, and morally strong environment. CDS, Inc. schools are tuition-free, open enrollment public charter schools that welcome all students, regardless of address, income, or ability. The family of schools includes Charter Day School in Leland, Columbus Charter School in Whiteville, Douglass Academy in Wilmington, and South Brunswick Charter School in Bolivia. Our family of schools has received numerous awards, including designations as a “Top-25 School for Academic Growth” and an “Honors School of Excellence” in the state of North Carolina. Nationally, Charter Day School received the 2016 Wesley Becker Excellent School award from the National Institute for Direct Instruction. In 2015-16, two of the top three elementary schools in Brunswick County were public charter schools in our family—Charter Day School and South Brunswick Charter School. In its first year of testing, South Brunswick Charter School achieved the highest reading score of all Brunswick County elementary schools. 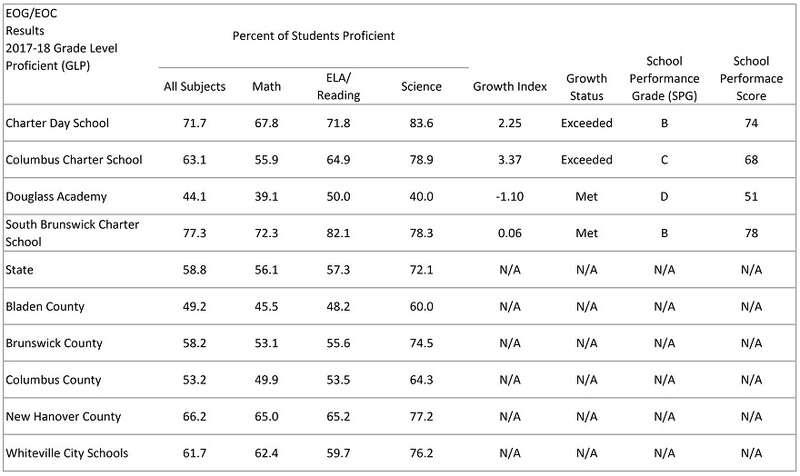 Columbus Charter School earned the highest academic growth score in Columbus County. In its second year of testing, Douglass Academy achieved a performance average ranging to nearly 30 percentage points higher than the three other elementary schools in its area. This superlative performance is particularly significant given that all schools are Title I schools, which indicates that more than 40% of student families are economically disadvantaged. In addition to an effective academic program, our family of schools offers students opportunities to participate in a range of extracurricular activities including a seven-time National Champion cheer squad and a seven-time State Champion archery program, among others. CDS, Inc.’s total enrollment continues to increase, as our public charter schools of choice now serve nearly 2,200 students between four campuses. We credit this growth to our priorities of providing a safe environment, character education, and academic excellence. All schools in our family offer an Open Enrollment period annually during the month of January. For more information or questions regarding this report card, please visit www.rogerbacon.net or contact the RBA corporate office at 910.655.3600. We will continue striving for excellence.